Enrollment for Apostolic Theological Seminary, Inc. Step 3 - When accepted, pay by check, credit or debit card, Western Union, etc. - To pay by credit or debit card: go to the "Home Page", towards the bottom left is a "Buy Now" button. Biblical language courses are $300. each; other semester courses are $250. each. Please pay for at least one course to enroll. If you are not paying for all courses, please contact the Kleins to set-up a payment plan. Then - You receive textbooks from Dr. Klein, or Amazon, etc. 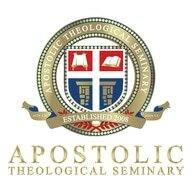 Enrollment Form for Apostolic Theological Seminary, Inc.
​ a payment plan can be arranged. To start, please call 337-285-6045 or 337-517-3954 to register, if you are accepted as a seminarian, then pay $250. tuition plus $35. covers the textbook, the shipping, plus the eLearning site where you view videos, read books, and take tests. You will receive Dr. Klein's book 'Which Bible Should You Use????' by snail mail. You will be taught by Dr. Klein by webinars on the internet. There are 8 courses at $250 per course. The tenth course is Seminary English Composition. The goal is for your thesis, when finished to be suitable for publication (book). 8 x $250. = $2,000. total cost for tuition for the Master of Arts in Biblical Studies. - The cost of $250. is the tuition cost per course. To start in the Master of Arts in Biblical Studies submit $285. after calling Dr. Bruce or Professor Dana Klein for acceptance into the degree program. To start in the Master of Arts in Jewish Studies submit $250. after calling Dr. Bruce or Professor Dana Klein for acceptance into the degree program. To start in the Master of Arts in Biblical Languages submit $300. after calling Dr. Bruce or Professor Dana Klein for acceptance into the degree program. are ways to pay tuition. Payment plans are possible, just ask. Everyone can earn a degree! You can earn a degree!